Having done locksmithing now for 10 plus years, the one lock that always fills me with dread is the Chubb 3G110 deadlock. I generally avoid them like the plague due to previous bad experiences. so you can imagine my concern when I arrived to an industrial unit for a repossession to identify the lock on the door as a Chubb 110 deadlock. However my satisfaction at smoothly opening this lock in under 30minutes will remain with me for some time. I don’t often see a Chubb 3G110 on residential properties but it is an excellent lock, easily recognisable by a tall case and a bolt at the top. the faceplate will say ’5 detainers’ meaning 5levers. It will also say Chubb but new locks will be marked as Union even though the lock is exactly the same. This is since Union bought out Chubb. 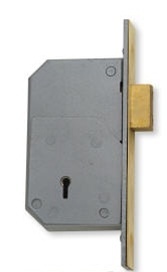 A locksmith will also recognise a Chubb 3G110 by the brass key which is a slightly thicker, longer and shallower blade than most other Chubbs. Even though these locks are great security and highly respected in the locksmith industry, the stupidity of the BS rating system and of insurers that this venerable and excellent lock has rarely had a British Standard during its life. If you have one of these and want to be super careful, and your insurance specifies a 5-lever lock, then you should ask for agreement in writing that a 110 5-detainer lock is acceptable.